Check out this cool 82-year-old metalhead, Owen Brown, cranking Megadeth’s ‘So Far, So Good …So What’ on vinyl. I’m not sure if he’s the world’s oldest headbanger – I think Dio’s got a good 30 or 40 years on him – but it’s still quite an achievement. And CLICK HERE to see metal albums on vinyl on eBay so you can be as cool as Owen. RJM Music Technology has some very interesting products at NAMM this year. I’m especially interested in the Mini Amp Gizmo, a smaller, less expensive version of the regular Amp Gizmo. I’ve often toyed with the idea of having my Marshall DSL50 modded so I can switch between Clean and Crunch modes, and if I combine this with the Amp Gizmo and a MIDI switch I’ll be totally set. If I was to combine that with the Effect Gizmo, I’d probably never leave the house again. I’d just be standing in front of my amp and pedal board, tweaking and riffing until I’m old and grey. 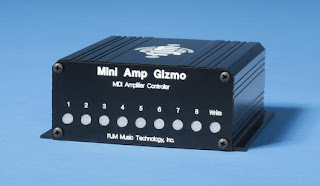 RJM Music Technology, Inc., makers of the RG-16, Amp Gizmo and Mastermind, has announced the Mini Amp Gizmo, a size and cost reduced version of their popular Amp Gizmo product. “In talking to many of our users, we found that the majority of them used their Amp Gizmos to control one multi-channel amp. By producing a MIDI amp controller specifically for that purpose, we were able to reduce both the size and cost of the product.” says Ron Menelli, RJM Music President and Product Designer. Like the original Amp Gizmo, the Mini Amp Gizmo will interface any compatible amplifier to a MIDI foot controller, allowing musicians to simultaneously switch effects and amplifier channels with a single tap of a MIDI controller button. The Mini Amp Gizmo will work with any standard MIDI foot controller, and can phantom power many controllers. RJM Music produces a wide range of amplifier interface cables that allows the Mini Amp Gizmo to control most amplifiers on the market – more than any other switcher available. The Mini Amp Gizmo will be available in March 2009 and will have an MSRP of $259.99 and a US street price of $199.99. RJM Music Technology, Inc., makers of the RG-16, Amp Gizmo and Mastermind, has announced the Effect Gizmo, the newest switcher in the RJM Music lineup. With this switcher, guitar players can connect up to twelve pedals or effects processors and can control them from any MIDI controller. The Effect Gizmo also contains the features that made the RG-16 a favorite of musicians worldwide, including the acclaimed high-quality audio buffer circuit and the simplest user interface found in an audio loop switcher. The Effect Gizmo will be available in March 2009 and will have an MSRP of $639.99 and a US street price of $549.99. Here’s a neat little idea from IK Multimedia. They’ve combined an audio interface with an expression pedal for control of wah, volume and pitch effects, or any other MIDI-controllable parameter. I use IK’s Amplitube program quite a lot and I’ve often wished I had the ability to control various effects with an expression pedal – like making a phaser speed up, or blending between two amp models. 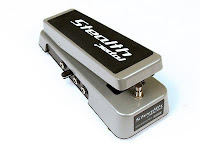 IK Multimedia presents the StealthPedal, the first guitar audio interface/software controller in a compact wah-style pedal, allowing users to record, play and control the included “Powered By AmpliTube” software, or any other MIDI controllable software, with the same feel and ease of use as a traditional guitar pedal. The built-in expression pedal and switch can be associated with any parameter of “Powered By AmpliTube” software, or any other amp and FX modeling software with MIDI control capabilities. The StealthPedal controls can also be expanded with an additional expression pedal and two extra switches for building a mini-pedalboard rig with preset and single effects control capabilities for full live/recording usage. knob and three LED indicators that operate as a status display, tuner or level indicator when used with any “Powered by AmpliTube” software. StealthPedal’s circuit design has been derived from IK’s StompIO high-end stage controller, ensuring the highest fidelity in the recording of for your guitar and bass with software configurable input gain level, 109dBA low noise input stage and optimal audio quality throughout. StealthPedal also comes with a must-have assortment of software including AmpliTube 2 Live guitar and bass amp and fx modeling software, standalone and plug-in, AmpliTube X-GEAR for further expandability with all “Powered by AmpliTube” software and Sonoma Riffworks™ T4 for immediate recording/composing/online sharing with your Mac or PC. The StealthPedal and the included plug-in is also compatible with all popular DAW software supporting ASIO and Core Audio drivers on PC and Mac. Additionally when used with the “Powered by AmpliTube” software the system can be expanded to nearly 200 gear models including the all-time classic, exclusive sounds of Ampeg®, Jimi Hendrix™ and the just announced Fender® edition. All of this makes the StealthPedal the most convenient, complete and expandable solution on the market, for playing/recording guitar and bass with the computer. CLICK HERE to see IK Multimedia products on eBay.